“What are you liking most about Ghana?” my classmate asked me the other day. “Dancing,” I said, without hesitation. During last week’s visit to the central region, which is northwest of the greater Accra region, our bus stopped in a rural village where we were to help build the foundation for a library. When a rainstorm kept us from getting to work, we began to dance in the rain with some of the local children. A couple of street drummers made music, and we moved to the rhythm of their beat. Although our original plan had fallen through, the afternoon was not a loss. We danced the time away with our new friends. Last night, dressed in the traditional African clothes we have each accumulated over the last three weeks, everyone in our group gathered together for a farewell dinner. While we ate, we were entertained by a group of drummers and accompanying dancers. The music pumped during dinner, and once we finished eating, the dancers called us all up onto the dance floor to teach us some of their moves. It was a perfect evening for dancing. My second favorite thing about Ghana, I told my classmate, is the food. Months before I ever left the United States for Ghana, I began anticipating the food. Having some African friends at home and at school, I’d already had the pleasure of tasting delicious dishes from Nigeria, Ethiopia, Kenya and other countries in African. Here I am, eating Ghanaian food three times a day, and loving it. I love jollof rice, foo-foo (a soft mixture of cassava grain and plantains) and red-red (bean stew made red by the addition of palm oil). Then there is grilled tilapia, fried plantains and banku (another cassava mixture that tastes something like sourdough mashed potatoes). The food is spicy and delicious. And the best part? Everything is eaten with one’s hands. At first, some of us were a bit apprehensive about forgoing silverware, but now we’re fully embracing this new way of eating! After deep consideration, the third thing I told my classmate I’d miss about Ghana is the timelessness. The only way I can think to describe this aspect of Ghanaian life is to introduce its opposite: the rushed, time-efficient nature of life in the United States. Even in a little town like Lexington, Virginia, I am always trying to efficiently and productively manage my time. Here in Ghana, we certainly have an everyday agenda of activities and classes, but we are also aware that time is fluid and our plans are subject to change. You would think I might be frustrated or feel unproductive but that’s not the case. I am relishing the relaxed nature of life here. There is plenty of time to retreat from the unrelenting sun and sit in the cool shade or to spend a little more time at lunch in the company of friends. It is a new and refreshing way of life for me and I am enjoying every bit of it. I realize that the three things I love about Ghana will soon become the three things I miss about Ghana. But I plan to continue dancing to African music. I bought a cookbook full of delicious Ghanaian recipes. And I’m learning to walk a little slower, sit a little longer and enjoy my time. Although I am leaving today, I believe I will bring a little bit of Ghana home with me. How Do You Define “Nice”? “Ghanaians are nice,” said Winni, our tour guide. It was our first full day in Ghana and she was leading our orientation. Several thoughts popped into my head in response to Winni’s claim: “How could a whole country be nice?” and “Of course she’s going to say that, she’s Ghanaian!” I quickly dismissed her comments as tour guide rhetoric, but that was on the first day of our trip to Ghana, and the experiences I’ve had in the two weeks since have proved her right. If you read my last post, you’re already acquainted with the nice taxi driver who saved my housemate Cathy and me from being hopelessly lost in Accra. Well, the story doesn’t end there. Two mornings after our misadventure, Cathy and I were enjoying our breakfast of mangoes and oatmeal when our other roommate’s phone rang. It was the original taxi driver calling—the one who had driven away with Cathy’s phone in the back seat of his car! He had found her phone that night and returned to Jerry’s to give it to us, but we had already left. So the next day, he went out and bought a charger for the dying phone. With the battery revived, he telephoned one of Cathy’s recent calls and reached Caroline! Cathy and he arranged to meet at a nearby plaza where she retrieved her phone. The three of us were shocked by this turn of events and extremely overwhelmed by the kind-heartedness of the taxi driver. On Saturday morning, my two roommates and I drove with our host family to a beautiful house where the wedding was to be held. Before the ceremony even began, we enjoyed some pre-show entertainment. Two jolly women sang songs, cracked jokes and contributed to a spirit of merriment that rippled through the crowd of more than 100 people. Just as the wedding was about to officially begin, a woman shuffled the three of us out of our seats and into a small backroom. We glanced at each other, confused, wondering why we had been removed from our seats. Soon we found out that we had just been appointed the newest members of the wedding party! 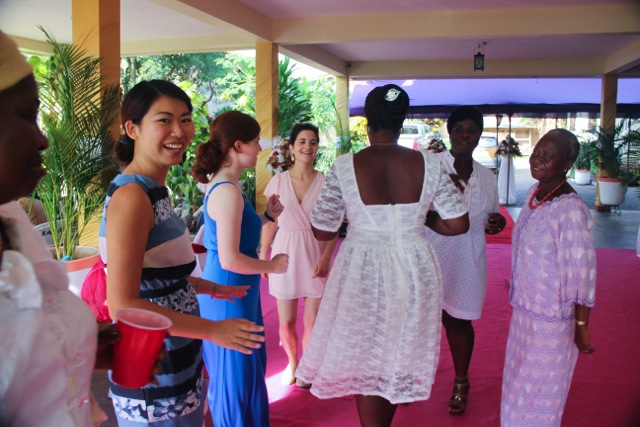 We fell into line with several other women and processed down the aisle with the bride, dancing along to calypso music. The guests in the audience clapped and smiled at us as we returned to our seats. After the two ceremonies had ended (a traditional African ceremony was followed by a Western-style one), we stayed to enjoy delicious food at the reception. My housemates and I approached the bride to give her our congratulations, somewhat embarrassed that we had crashed her wedding. But she was as gracious and nice as Winni had promised. “Thank you so much for coming!” she said, offering to take a picture with us. The new groom welcomed us heartily as well, even expressing his hope that we would attend services at their church on Sunday. These two experiences—as well as a number of others that I do not have the space to transcribe—have me convinced that Winni was right and Ghanaians are truly, genuinely “nice.” I consider myself blessed to be able to enjoy their company this month. *Take a look at our Instagram page instaghana288 for more pictures of our adventures! After a delicious meal of mashyam (mashed up yam covered in a spicy soup) with our host family, we left the house for Jerry’s. Cathy made sure to save the location of our house on her phone’s map so we’d know how to get back. 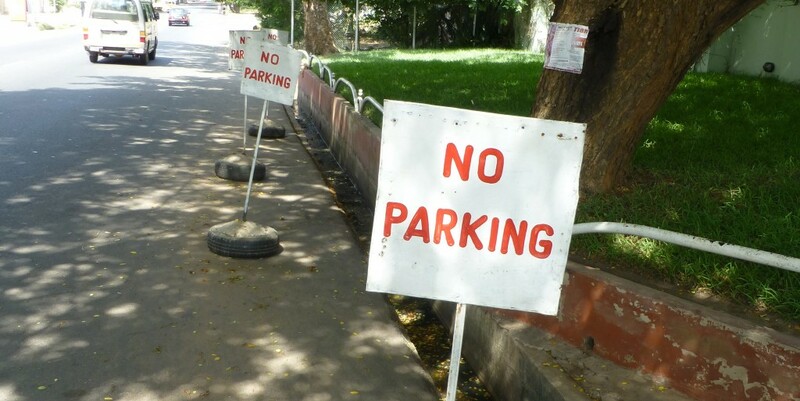 There are few street names in Ghana, so people must rely on a combination of arrows, landmarks, and ubiquitous road signs to get around. With our professors’ advice to “stay away from isolated areas” in mind, we quickly made our way through the mostly empty streets of our neighborhood. It took us a while to realize we were walking in circles. Eventually, we found ourselves on the main road and hailed a cab to Jerry’s. When we arrived, we hurried out of the cab, eager to find our classmates and spend a night on the town in Accra. Once inside, we began to look around for our friends but we didn’t recognize anyone. “Let’s call them,” I suggested. Since my phone had not yet become acquainted with Ghanaian cell service (which is spotty at best and utterly frustrating at worst), I turned expectantly toward Cathy. She shuffled items around in her purse. “I think I left my phone in the cab. It was on my lap and must have slipped off when we got out,” she said desperately. We stood there silently, coming to terms with the fact that we were stuck. We had no contacts, no map, and, we soon realized, no friends at Jerry’s. Apparently, they had all left while we had been wandering the streets of our homestay neighborhood. All that was left to do was sit down, have a beer, and figure out a game plan. The only resources we had were the landmark, “Magnolia Lodge,” near our homestay and my rapidly fading sense of direction. We were feeling pretty hopeless. We soon decided we should leave. Neither of us knew how long it would take to get back and we needed to make it home before the lights went out (Ghana is enduring a country-wide power shortage; only a certain number of power hours are allotted per day and many people rely on generators). Unfortunately, none of the taxi drivers we approached knew where Magnolia Lodge was. After paying five cedis (Ghanaian dollars) too much for a cab ride down the street and feeling more and more like an oburoni (“foreigner” in Ghanaian Twi), Cathy and I came upon a hotel where the receptionist graciously searched online and found us a loosely-drawn map to the lodge. Reinvigorated, Cathy and I returned to the street and hailed another cab. We got lucky — this cab driver was actually an angel. After several twists and turns, he got us back to Magnolia Lodge. That should have been the end of the story but, as it was only our second day in Ghana, Cathy and I were unsure which house was ours. It didn’t help that, by this time, a power outage had blanketed the city in darkness. The cabbie pulled over to ask directions from a group of guys on the side of the road. They seemed helpful at first but soon started jeering at us and getting too close to the car. Cathy and I were freaked out, but thankfully, the driver was unfazed. He drove off, leaving the group of guys in a cloud of dust. “Wait! That’s it!” Cathy suddenly called out. Sure enough, just down the street from where we had left the group of men, was our homestay. Once our taxi driver/angel saw us safely inside the house, we could finally relax and even laugh at our series of misfortunes. Coming on this trip, I didn’t expect to find myself so unprepared. Our professors talked about Ghana’s challenges, including its lack of infrastructure, but it was hard to envision how those challenges played out in daily life. Going without cell service, power and even road signs has helped me see the picture more clearly. While I acclimate to life in Ghana, I appreciate the genuine kindness and helpfulness local Ghanaians are showing this oburoni. Born and raised in Everett, Massachusetts, Faith E. Pinho is a freshman at Washington and Lee University. She is double majoring in Politics and Journalism, and minoring in French with the intent of becoming a political journalist. Faith works for the Office of Diversity and Inclusion on campus, writes for W&L’s student-run newspaper The Ring-tum Phi and plays saxophone for the University Jazz Ensemble. When she is not participating in a number of other student diversity organizations, Faith loves to indulge her creative outlets, which include exploring her surroundings, cooking and crocheting. Spring Term Afield is a blog that brings together nearly two dozen Washington and Lee students who are traveling all over the world as part of the university’s special, four-week spring term. Learn more about spring term.